EcoStruxure is Schneider’s IoT-enabled, plug-and-play, open architecture and platform where we collaborate with the largest community of Partners and Developers Ecosystem on 6 domains of expertise – Power, IT, Building, Machine, Plant and Grid. 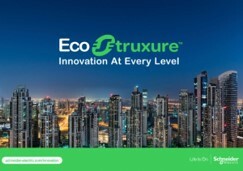 EcoStruxure brings together Innovation At Every Level from Connected Products to Edge Control, and Apps, Analytics and Services, to provide end-to-end solutions for 4 end markets: Building, Data Center, Industry and Infrastructure, delivering enhanced value around safety, reliability, operational efficiency, sustainability, and connectivity for our customers. As of 2016, 450,000 EcoStruxure systems have been deployed, with the support of 9,000 system integrators and an estimated 160,000 industrial software developers, connecting more than 1 billion devices to the Edge Control layer of EcoStruxure. Discover how we are envisioning a sustainable future by solving the energy paradox.